Top orthopedic surgeon Dr. Jacob Rozbruch has been featured in a variety of media articles for his insight on orthopedics. Some of the most esteemed publications have turned to Dr. Jacob Rozbruch for his knowledge and expertise, including The New York Times, The Philadelphia Inquirer, and many more. Additionally, Jacob Rozbruch MD has been repeatedly named a Top Doctor by Castle Connolly for his expertise in the field of orthopedics. 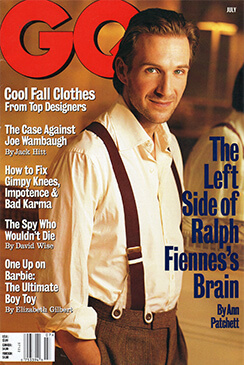 Jacob Rozbruch MD was inducted to New York Magazine’s Hall of Fame as the top orthopedic surgeon in NYC. Dr. Jacob Rozbruch has shared his insight on various medical conditions, including piriformis syndrome, arthritis, ankle fractures, wrist sprains, and more. To read more about Dr. Jacob Rozbruch, his past cases, and some orthopedic conditions that he treats, please click on the below media articles. School girl Nicole Cahill walks unaided after orthopedic surgery was performed by Jacob Rozbruch, MD in NYC. 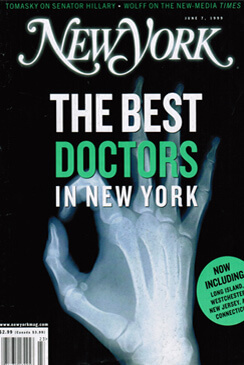 NYC orthopedic surgeon Jacob Rozbruch makes New York Magazine’s Hall of Fame List of Best Doctors in New York City and surrounding areas. Jacob Rozbruch MD combines all of the best attributes of a surgeon to provide patients with top-notch care. An orthopedist in NYC, Jacob Rozbruch, MD discusses allografting and ACL surgery with GQ Magazine. Dr. Jacob Rozbruch performed a tendon replacement on a patient through a technique known as allografting, which can dramatically reduce recovery time. After allografting, the tendon continues to strengthen for yet another year. Jacob Rozbruch MD goes on to explain the decreased recovery time from an allografting procedure. Dr. Jacob Rozbruch, an orthopedic surgeon in New York City, discusses the causes and symptoms of tendinitis and bursitis. Jacob Rozbruch MD offers advice on how to avoid pain and limit your chance of developing these conditions as well as some common remedies for patients who already have bursitis or tendinitis. 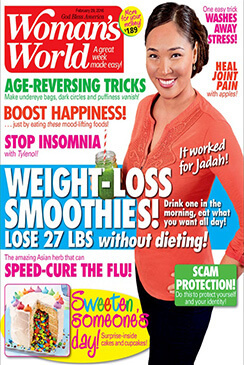 Orthopedic surgeon Jacob Rozbruch was featured in Woman’s World Magazine to discuss shoulder health. Jacob Rozbruch MD offers tips and advice on how to avoid shoulder pain or shoulder injuries in everyday life. Dr. Jacob Rozbruch shares his insight on how a heavy handbag may cause shoulder discomfort in some women. NYC orthopedic surgeon Jacob Rozbruch MD has received the title of Top Doctor in the New York Metro Area for the year of 2019. This honor comes as a result of his dedication to patients, education and training, medical achievements, and more. Dr. Rozbruch is among a portion of NYC physicians deemed to provide award-winning care in their fields. 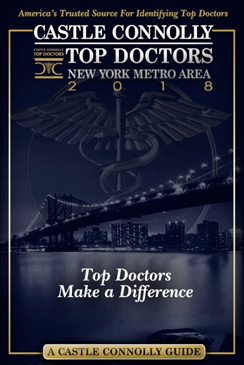 Dr. Jacob Rozbruch is named a Castle Connolly Top Doctor of the New York Metro Area for the year of 2018! As a highly regarded orthopedic surgeon in NYC, Dr. Rozbruch is among a fraction of New York physicians to receive this honor. He has been awarded this title because of his professionalism, medical education, skill as a surgeon, and goal to provide each patient with the best care possible. New York orthopedic surgeon Jacob Rozbruch MD has been named one of the Top Doctors of 2018 by Castle Connolly. Castle Connolly carefully reviews each nominee with a physician-led panel and chooses honorees based on a rigorous review process. Dr. Rozbruch is featured as a top doctor for his exceptional education, training, medical achievements, and more. The American Registry has determined that Dr. Jacob Rozbruch, an orthopedic surgeon in New York, is in the top 1% of America’s Most Honored Professionals for the year of 2017. To be awarded this prestigious honor, Dr. Jacob Rozbruch’s peer reviews, patient testimonials, and more were closely examined to determine that he offers the best orthopedic care possible in NYC. Jacob Rozbruch MD is named a 2017 Top Doctor in the New York Metro Area by Castle Connolly! Each Castle Connolly nominee is chosen by peers and carefully reviewed by a physician-led research team. 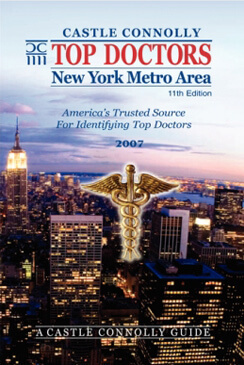 Only a fraction of New York Metro Area physicians are given this prestigious honor. Jacob Rozbruch MD is featured as a top doctor in the field of orthopedic surgery. Dr. Jacob Rozbruch has been named one of Castle Connolly’s Top Doctors in the New York Metro Area for the year 2016! All Castle Connolly nominees are subject to a rigorous peer review process which examines a variety of qualifications, including education, training, awards, certifications, and medical achievements. Jacob Rozbruch MD is part of a small number of NYC physicians to receive this acclaimed award for his work in the field of orthopedic surgery. Dr. Jacob Rozbruch, a talented orthopedic surgeon in Manhattan, has been awarded the title as a Castle Connolly Top Doctor for the year of 2015. Potential Top Doctors are nominated by fellow physicians and reviewed by Castle Connolly’s physician-led research team. Physicians are rigorously reviewed by Castle Connolly to ensure their professionalism and patient care are of the highest level. NYC orthopedic surgeon Jacob Rozbruch is named a 2014 Top Doctor in New York by Castle Connolly. This award is reserved for the top physicians in their respective fields. 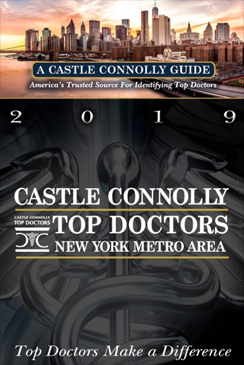 Each Castle Connolly Top Doctor is selected after a thorough review process which takes into account a variety of factors, including medical education, training, achievements, and certifications. Dr. Jacob Rozbruch is recognized for his expertise in orthopedic surgery. 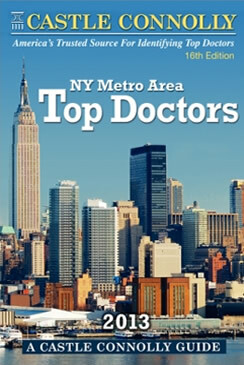 New York orthopedic surgeon Jacob Rozbruch has been listed as a Top Doctor in Castle Connolly 16th edition of Top Doctors: New York Metro Area in 2013! 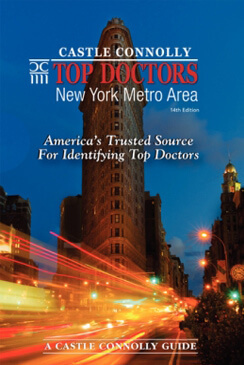 This acclaimed guide features the top medical specialists in New York who are regarded highly by both their peers and patients. The credentials of each physician are carefully reviewed, and medical education, hospital appointments, professional achievements, and disciplinary history are all considered while selecting physicians. 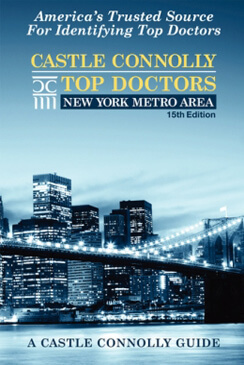 New York orthopedic surgeon Jacob Rozbruch has received an award as a Top Doctor by Castle Connolly in 2013. 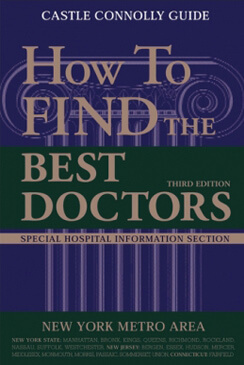 Before being awarded as a Top Doctor, a physician-led research team carefully examines facts about the physician, including medical education, training, certifications, hospital appointments, professional achievements, and disciplinary history. With nearly 100,000 nominations each year, the selection process is rigorous. 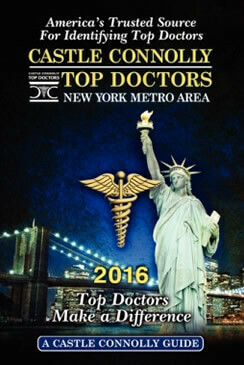 Dr. Jacob Rozbruch, a renowned orthopedic surgeon in NYC, has been named by Castle Connolly as one of the Top Doctors in the New York Metro Area for the year of 2012. Dr. Jacob Rozbruch was nominated for this award by his peers due to his immense talent and skill as an orthopedist. After conducting an in-depth review, Castle Connolly deemed Jacob Rozbruch MD to be one of the best orthopedic surgeons in the metropolitan area. Orthopedic surgeon Jacob Rozbruch has been named a Top Doctor by Castle Connolly for the year of 2012. The skill, ability, and unmatched care that Jacob Rozbruch MD provides each of his patients has earned him the distinction of being named a Top Doctor. Physicians with this accolade are considered to be some of the best in their respective fields. Dr. Jacob Rozbruch, a prominent orthopedic surgeon, has been named as one of New York’s Favorite Physicians by the American Registry. He has been chosen as a 5 year honoree and received the Patients’ Choice Award for favorite physicians in the New York Metropolitan area. 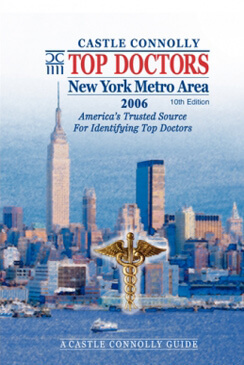 Congratulations to Dr. Jacob D. Rozbruch on being named one of the New York Metro Area's Top Doctors in 2011 by Castle Connolly Medical Ltd. 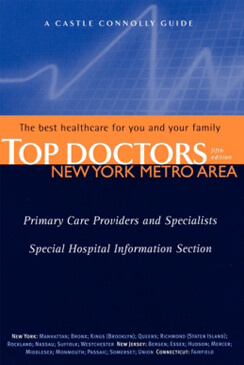 The selection by Castle Connolly as one of the New York Metro Area's Top Doctors signals that the quality of Dr. Jacob Rozbruch's medical work is highly regarded by his fellow physicians. He is widely considered to be outstanding in the field of orthopedics and orthopedic surgery. 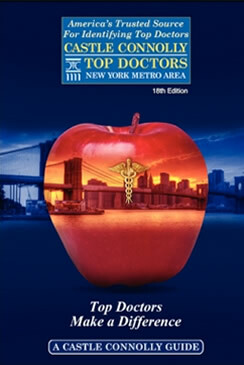 Jacob Rozbruch, MD has been awarded as a Top Doctor in the New York Metro Area by Castle Connolly for 2007. 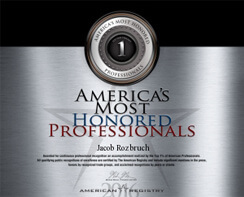 Jacob Rozbruch MD was awarded this prestigious accolade for his unparalleled care in the field of orthopaedic surgery. 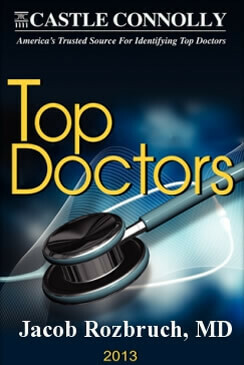 Each nominee is extensively reviewed to ensure that only the best physicians are named as a Top Doctor. 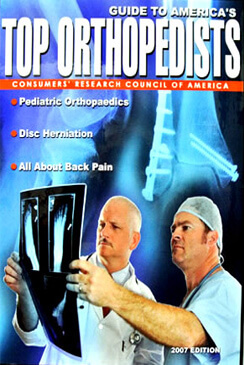 The Consumers’ Research Council of America has named Dr. Jacob Rozbruch in the Guide to America’s Top Orthopedists for the year of 2007. Dr. Jacob Rozbruch, a highly sought-after orthopedic surgeon in NYC, has been named among the best orthopedists for his exceptional bedside manner, his technical skill in the operating room, and his commitment to each of his patients. 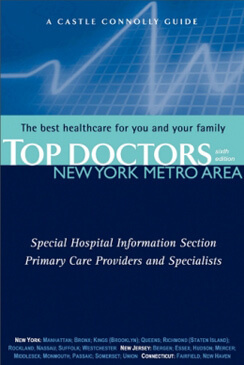 Castle Connolly has named Dr. Jacob Rozbruch as a Top Doctor in the New York Metro Area for the year of 2006. While over 100,000 physicians are nominated annually, Castle Connolly only awards this honor to a portion of the physicians who have been deemed to provide the best level of care in their respective fields. Jacob Rozbruch MD has been selected as a recipient of this award for his expertise in the field of orthopedic surgery. 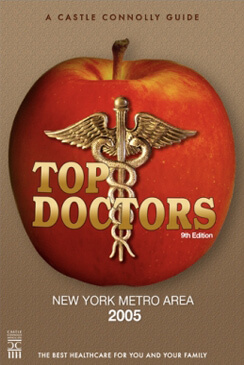 Congratulations to Jacob Rozbruch, MD for being honored as a Top Doctor in the New York Metro Area for 2005 by Castle Connolly. 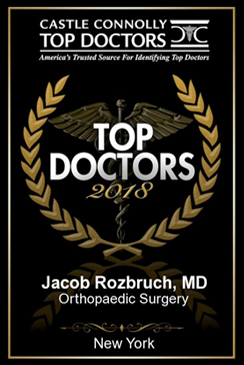 Dr. Jacob Rozbruch has been named a Top Doctor in the field of orthopedic surgery due to his skill as a surgeon, his individualized patient care, and his determination to provide each of his patients with the best level of care possible. Dr. Jacob Rozbruch, an orthopedist in New York, has been named as a Top Doctor in the New York Metro Area for the year of 2004 by Castle Connolly. Castle Connolly reviews each nominated physician’s credentials, level of training, and achievements to ensure that only the best physicians are awarded this prestigious accolade. 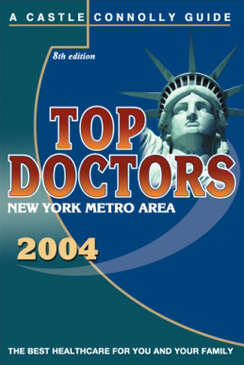 Dr. Jacob Rozbruch has been awarded the title of Top Doctors in the New York Metro Area by Castle Connolly for the year of 2003. Physicians are nominated for this award by their colleagues. With over 100,000 nominations annually, Castle Connolly employs a highly respected research team to determine which physicians are the best in their field. Castle Connolly has named Dr. Jacob Rozbruch, an orthopedic surgeon in New York City, as a Top Doctor in the New York Metro Area for the year 2002. Jacob Rozbruch MD provides unmatched skill and is among the best doctors in the field of orthopedic surgery in NYC. Castle Connolly compiles this list of Top Doctors to help patients find the best physicians and specialists. 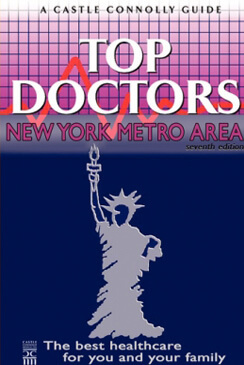 Congratulations Dr. Jacob Rozbruch for being named among the Top Doctors in the New York Metro Area by Castle Connolly in 2001. Dr. Jacob Rozbruch’s immense talent as an orthopedist has earned him the prestigious title of a Top Doctor in the field of orthopedic surgery. While over 100,000 physicians are nominated annually, less than 5% of these physicians are awarded with this prestigious title. Jacob Rozbruch MD, a highly esteemed orthopedic surgeon, is honored to be named one of the Best Doctors in the New York Metro Area for the year of 2000 by Castle Connolly. Castle Connolly reviews each nominated physician’s medical education, board certifications, administrative posts, and more to select only the best physicians in each medical specialty. Castle Connolly has honored Dr. Jacob Rozbruch with the title of one of the best doctors in the New York Metro Area for the year of 1999. Physicians must be nominated for this award by their colleagues and peers. A physician-led research panel then conducts in-depth reviews of each physician to determine which physicians are the most respected in their particular field. Jacob Rozbruch MD has received this award for his excellent patient care in the field of orthopedics. 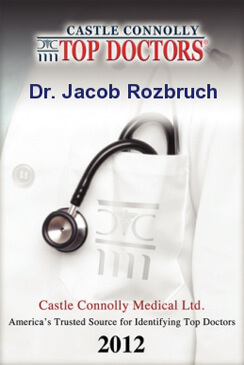 Jacob Rozbruch MD has been named as one of The Best Doctors by Castle Connolly in New York Magazine in 1998. Dedicated to providing the best in orthopedic surgery, Dr. Jacob Rozbruch is honored to be awarded this prestigious title. Over a 100,000 physicians are nominated for the award annually, but only a small fraction of these physicians are determined to be among the best in their field. 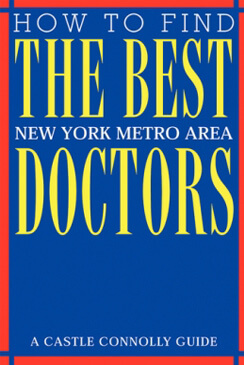 Castle Connolly has named Dr. Jacob Rozbruch among some of The Best Doctors in the New York Metro Area in 1997. 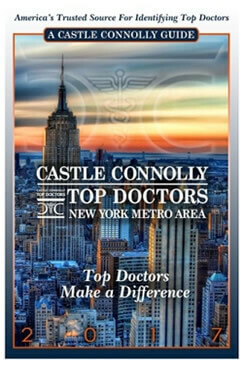 Castle Connolly is dedicated to assembling a comprehensive list of NYC’s best doctors annually so that patients are able to find the top physicians in each medical specialty. Jacob Rozbruch MD has receive this award for his continued excellence in the field of orthopedic surgery. Congratulations to orthopedic surgeon Dr. Jacob Rozbruch for receiving the honor of Vitals Patients’ Choice Award 2019. 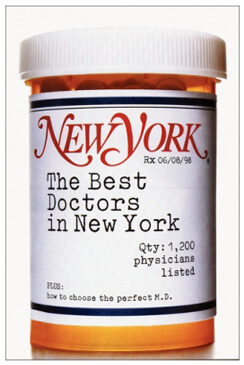 This accolade means that he was nominated by his patients as one of the best physicians in New York. He has received this honor because of the compassion and commitment that he dedicates to each patient. Dr. Jacob Rozbruch, an orthopedist in NYC, has been recognized by Vitals as one of the most compassionate doctors in his field. This award is reserved for only the most thorough, friendly, and caring physicians, and Dr. Rozbruch’s patients have deemed him worthy of this accolade. Dr. Rozbruch aims to provide the best care possible for each of his patients and demonstrates incredible compassion and commitment while doing so. Dr. Jacob D. Rozbruch, renowned orthopedic surgeon in New York, has been named one of America’s Most Honored Professionals by The American Registry. This title is awarded to the top 5% of American Professionals. Dr. Rozbruch received this honor after examination of his patient testimonials and peer reviews determined that he provides exemplary orthopedic care in NYC. Dr. Jacob Rozbruch, an orthopedic surgeon in NYC, has been ranked among the top 1% of America’s Most Honored Professionals in 2016 by the American Registry. Physicians are closely evaluated by a team of experts to ensure that only the best physicians are awarded this impressive accolade. 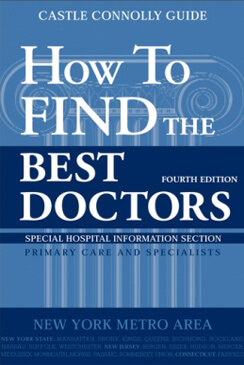 All physicians awarded this title are considered to be some of the best in their field. 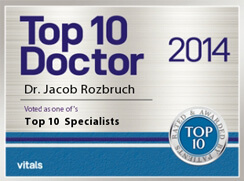 Congratulations to Dr. Jacob Rozbruch for being named as one of the top 10 doctors in 2014 from Vitals. Dr. Jacob Rozbruch was voted as one of the top 10 specialists in the field of orthopedic surgery. Vitals selects these physicians carefully after reviewing their ratings and other quality measures to create a list of the best specialists. 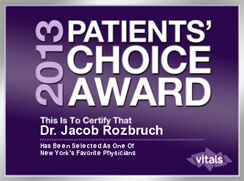 Dr. Jacob Rozbruch, an esteemed orthopedic surgeon in Manhattan, has received the Vitals Patients’ Choice Award for 2014. This honor means that Jacob Rozbruch MD was nominated as one of New York’s favorite physicians by his patients. 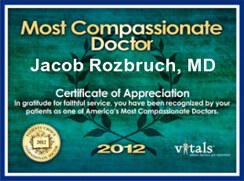 Dr. Jacob Rozbruch is known for his compassionate bedside manner and commitment to each and every one of his patients. 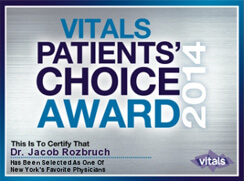 Jacob Rozbruch, MD has been awarded Vitals Patients’ Choice Award in 2013 for his work in the field of orthopedics. 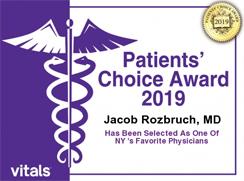 Patients have selected Jacob Rozbruch MD as one of New York’s favorite physicians due to his friendly bedside manner and dedication to provide only the best level of care to each of his patients before, during, and after a visit to his NYC office. Vitals has recognized Dr. Jacob Rozbruch as one of the most compassionate doctors in the field of orthopedic surgery in 2013. Jacob Rozbruch MD is well-known for his exceptional level of patient care. Dr. Jacob Rozbruch’s patients remark that he is one of the most thorough, friendly, and deeply caring physicians that they have ever met. 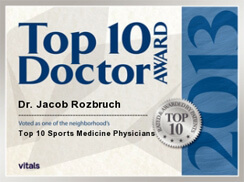 Congratulations to Dr. Jacob Rozbruch for being named among the top 10 sports medicine physicians by Vitals for the year of 2013. Vitals evaluates each physician’s reviews, their patient testimonials, and other quality measures to ensure that only the best physicians in each medical specialty are awarded this respected accolade. 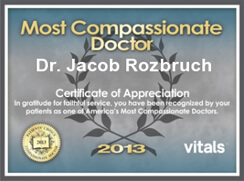 Dr. Jacob Rozbruch has been honored with the title as the Most Compassionate Doctor by Vitals for the year of 2012. Dr. Jacob Rozbruch’s patients often refer to him as one of the friendliest, most comprehensive, and caring physicians that they have ever had. 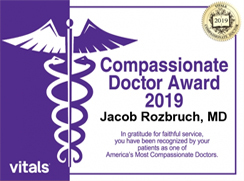 Patients of Jacob Rozbruch MD understand that he cares deeply about each individual and will do all that he can to provide the best level of care for them. 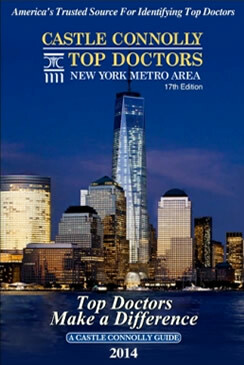 Jacob Rozbruch MD has been selected as one of New York’s favorite physicians in 2012. Due to his capability as an orthopedist and his dedication to each of his patients, Dr. Jacob Rozbruch has been honored with this respected Patients’ Choice Award. Dr. Jacob Rozbruch’s care philosophy includes providing only the highest level of care to every one of his patients. Merchant Circle has honored Dr. Jacob Rozbruch, an orthopedic surgeon in NY, with the Circle of Excellence Achievement for the year of 2012. 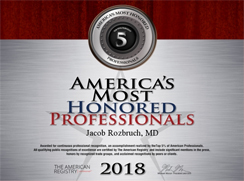 This accomplishment shows that Dr. Jacob Rozbruch’s practice is considered to be exceptional and one of the best orthopedic surgery offices in the entire metropolitan area. To be awarded this achievement, businesses must maintain a rating of 4 stars or higher. 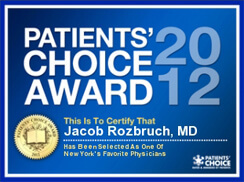 Congratulations to Jacob Rozbruch, MD for receiving the 2011 Patients’ Choice Award. 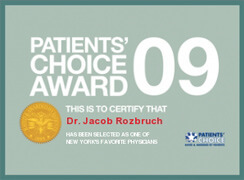 This accomplishment deems Jacob Rozbruch MD as one of New York’s favorite physicians. Dr. Jacob Rozbruch provides excellent care in the field of orthopedic surgery. 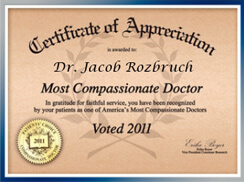 Dr. Jacob Rozbruch has been awarded the Patients’ Choice Award for the Most Compassionate Doctor of 2011. Patients of Jacob Rozbruch MD remark that he is an incredibly thorough, comprehensive doctor who does not rush consultations or appointments. Because of his extraordinary level of patient-oriented care, Jacob Rozbruch MD has been honored with this esteemed award. 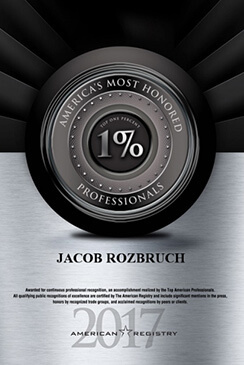 Jacob Rozbruch, MD has been awarded the Circle of Excellence Award by Merchant Circle for the year of 2010. Dr. Jacob Rozbruch’s medical practice has been honored for its excellence due to the continued commitment to its patients and providing the highest level of care possible. 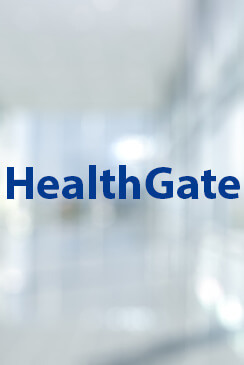 Merchant Circle awards this title to only the best physicians and medical practices. Orthopedic surgeon Jacob Rozbruch MD has won the 2010 Patients’ Choice Award! 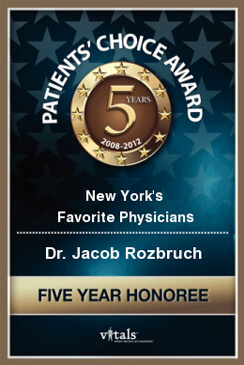 This accolade certifies that Jacob Rozbruch MD has been selected as one of New York’s Favorite Physicians. Patients of Dr. Jacob Rozbruch describe him as dedicated, caring, and thorough. These attributes, along with his technical skill as an orthopedic specialist, have earned him this honorable distinction. 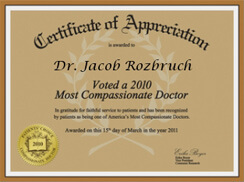 An orthopedist in NYC, Jacob Rozbruch MD has been voted as a Patient’s Choice 2010 Most Compassionate Doctor. This honor is only given to a portion of physicians who display unmatched patient care and unparalleled talent. Dr. Jacob Rozbruch’s patients describe him as caring and thorough. Many of his patients also remark about how they never feel rushed during an appointment with Dr. Jacob Rozbruch. 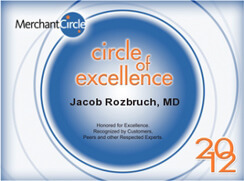 The medical practice of Jacob Rozbruch has been awarded the Circle of Excellence Award by Merchant Circle for 2010. This accolade is only granted to physicians and practices known for superior patient care and maintaining a minimum of a 4-star rating. Jacob Rozbruch MD has been honored for his continued merit in orthopedics. 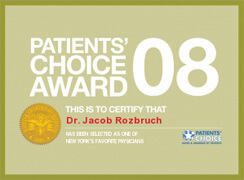 Jacob Rozbruch, MD has been given the Patients’ Choice Award for 2009. 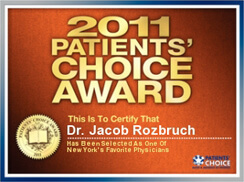 This award certifies that Jacob Rozbruch MD has been voted as one of the favorite physicians in the New York area. Dr. Jacob Rozbruch is dedicated to providing patients with the best care using the most innovative, state-of-the-art techniques currently available. 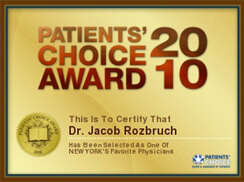 Dr. Jacob Rozbruch is proud to accept the 2008 Patients’ Choice Award as one of New York’s Favorite Physicians. Prioritizing his patient’s health, Jacob Rozbruch MD is deeply committed to compassionate patient care and helping his patients lead the healthiest lives possible. Jacob Rozbruch MD is delighted to continue offering top-notch orthopedic care to all of his patients. Dr. Jacob Rozbruch discusses Achilles tendon surgery in Platform Tennis News. Dr. Rozbruch explains how Achilles tendon tears can be diagnosed and treated. Depending on the specifics of your injury, surgery or rest may be recommended. Dr. Rozbruch also stresses the importance of having an Achilles injury examined by an orthopaedist to ensure your injury is properly diagnosed and treated. Dr. Jacob Rozbruch is honored in U.S. News & World Report as one of the Nation’s Top Doctors in the field of orthopedic surgery. Highly respected by his peers and patients alike, Dr. Jacob Rozbruch has been practicing orthopedic surgery in New York for over 38 years! He remains at the forefront of orthopedic surgery, specializing in knee, shoulder, and spinal surgery. Dr. Jacob Rozbruch and his team at the Mount Sinai Beth Israel Hospital were recently honored on Becker Hospital Review’s list of “101 Hospitals with Great Orthopedic Programs.” Dr. Jacob Rozbruch serves as Emeritus Chief of General Orthopedic Surgery at the hospital and has practiced orthopedic surgery in New York for over 38 years. He shares his knowledge and expertise with others at the Mount Sinai Beth Israel Hospital, helping them perform around 9,000 surgeries annually. Nicole Cahill, a 10-year-old from Marshalstown, Ireland, suffered a viral infection that left her unable to walk. While some physicians told Nicole that she would never walk again, Nicole’s parents planned to bring her to New York City for further evaluation. Under the skillful care of Jacob Rozbruch MD, Nicole’s surgery was a success. Following a 6 month period of recovery, Nicole was able to take her first steps. 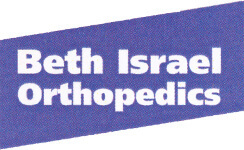 Jacob D. Rozbruch is an orthopedic surgeon in New York City who has been highlighted for his 38 years of experience as Chief of General Orthopedics at Mount Sinai Beth Israel Hospital. Dr. Jacob Rozbruch is known for his expertise in lumbar spinal stenosis, knee surgery, total patient care, and more. Jacob Rozbruch MD has been credited with building Beth Israel’s orthopedic department into one of the largest in NYC. NYC orthopedic surgeon Jacob Rozbruch performed surgery on a 10-year-old girl from Ireland to restore her ability to walk. After suffering a viral infection, Nicole, from County Wexford in Ireland, was told that she may never be able to walk again by physicians. Nicole traveled to New York City and met with Jacob Rozbruch MD who performed state-of-the-art surgery, care, and rehabilitation at Beth Israel Medical Center in New York. A little girl from Ireland undergoes tests and medical examinations in NYC after being told by several physicians that she may never walk again. Dr. Jacob Rozbruch and the prestigious Beth Israel Medical Center reach out to offer in-depth medical testing and care to treat her as effectively as possible. A young girl from County Wexford named Nicole was told that she would be unable to walk due to the severity of certain medical conditions. Nicole’s parents planned for her to receive treatment at Beth Israel Medical Center in New York City, one of the most prestigious hospitals in the country. After a 6-month-long recovery time following surgery, Nicole is now able to walk again. Nicole is a young girl from southeastern Ireland who has faced many medical hardships. Among these hardships, Nicole was told that she would never be able to walk again. Fortunately, Nicole and her family have arranged for her to receive treatment at Beth Israel Medical Center in New York City. Nicole, a young girl from County Wexford in Ireland, was told she would never walk again by previous physicians. Under the expert care, guidance, and rehabilitation of NYC orthopedic surgeon Dr. Jacob Rozbruch, Nicole was able to take her first steps following a 6-month-long recovery. Dr. Jacob Rozbruch was able to help Nicole regain mobility and lead a healthier life. Orthopedic specialist Dr. Jacob Rozbruch discusses the rise in sports-related injuries among the baby boomer generation. Jacob Rozbruch MD explains that baby boomers are commonly afflicted by strains, sprains, aches, and other injuries. To avoid injury, Jacob Rozbruch MD suggests older patients undergo a physical and start out slow when getting back into sports or exercise. Orthopedic surgeon Jacob Rozbruch was featured in The New York Times to discuss hip replacement surgery. For patients with an arthritic hip, hip arthroplasty can mean an active life once again. A top hip replacement surgeon in NYC, Dr. Jacob Rozbruch explains the difference between uncemented and cemented hip replacements and how this surgery can chance a patient’s life. An orthopedic specialist in Manhattan, Jacob Rozbruch MD shares his insight on torn rotator cuffs and their treatments. Jacob Rozbruch MD explains that repetitive movements can cause an overuse injury to occur in some patients. While many torn rotator cuffs are caused by an overuse of the shoulder, a torn rotator cuff treatment or surgery can help restore shoulder mobility. Dr. Jacob Rozbruch was featured in Newsday to discuss Lawrence Taylor’s ruptured Achilles tendon and Achilles tendon surgery. An expert in orthopedic surgery, Dr. Jacob Rozbruch explains the particular details of an Achilles tendon injury and surgery. Jacob Rozbruch MD also weighs in on Taylor’s condition following surgery. Jacob Rozbruch MD offers his opinion on child athletes and how much involvement in sports is too much for young athletes. Urging parents to let young athletes set their own pace, Dr. Jacob Rozbruch explains that it is important to not make a young athlete train too intensely. Jacob Rozbruch MD goes on to explain that overuse injuries can occur in children and that children should take a break from sports if playing causes any pain. Dr. Jacob Rozbruch, an orthopaedic surgeon in NYC, discusses Jerry Rice’s injury following his reconstructive knee surgery. Dr. Rozbruch, an expert in conditions and injuries to the knees, shares his opinion on knee surgery and its recovery time. While knee surgery is a highly effective treatment for a variety of conditions, full recuperation should not be rushed for the best results possible. Dr. Jacob Rozbruch has been featured in The New York Times for his expertise in foot and ankle surgery. A prominent orthopedic surgeon in NYC, Dr. Jacob Rozbruch specializes in torn Achilles tendon surgery. Dr. Jacob Rozbruch’s skill in the operating room can help an athlete with a torn Achilles tendon safely return to sports again after healing. Jacob Rozbruch MD explains that women tend to have less muscle around the knee joint. As muscle protects ligaments from damage, certain women may be more prone to a knee ligament injury or condition due to the decreased amount of muscle. Various exercises and precautions can be used to reduce the risk of a future knee injury. Parent Guide features orthopedic surgeon Jacob Rozbruch to discuss preventing injuries on the playing field in young athletes. Jacob Rozbruch MD discusses some of the most common injuries that afflict young athletes. To minimize potential injuries, Dr. Jacob Rozbruch believes children should undergo a preseason musculoskeletal physical, which can be extremely helpful in determining if the child may be more prone to a certain type of injury or not. Jacob Rozbruch MD is an arthritis specialist who treats arthritis and osteoarthritis of the hip, knee, and shoulder. Lending his expertise on knee arthritis and potential treatments, Dr. Jacob Rozbruch weighs in on his thoughts about hemicallotasis, a type of joint realignment surgery that was developed in Europe. Dr. Jacob Rozbruch discusses the details of this surgery and its place in future medical studies with The Philadelphia Inquirer. Dr. Jacob Rozbruch is a hip surgeon in NYC who offers hip replacement surgery and revision hip replacement surgery. Jacob Rozbruch MD discusses advancements in hip replacement surgery that will continue to increase the longevity of artificial hip joints. Orthopedic surgeons continue to implement innovative techniques and practices, which have increased the lifespan of artificial joints from a few years to upwards of a decade. Continuing advancements will allow artificial joints to last even longer in the future. Hip replacement surgeon Dr. Jacob Rozbruch discusses hip arthroplasty, cemented hip replacements, and uncemented hip replacements. Dr. Jacob Rozbruch shows the benefits of hip replacement surgery and recent advancements in technology that make hip surgery ideal for younger patients. Hip replacement surgery is an ideal treatment for an arthritic hip and can help patients return to everyday life and even sports. Orthopedic surgeon Dr. Jacob Rozbruch discusses rotator cuff tears and injuries. Jacob Rozbruch suggests various precautions to take to avoid a torn rotator cuff and also suggests that any sports-related pain should be evaluated by an orthopedist immediately. An early diagnosis of a sports-related injury can reduce the amount of damage done to the rotator cuff and can help restore proper mobility sooner. Dr. Jacob Rozbruch has been featured in Newsday to discuss sports-related injuries pertaining to high school sports teams. After evaluating a high school football team, Jacob Rozbruch MD found that many players had pre-existing medical conditions or a high likelihood of developing future sports-related injuries. Dr. Jacob Rozbruch suggests that a proper exercise routine with weight training can reduce the likelihood of some sports injuries, as muscle protects ligaments in the body. An orthopedic surgeon in NYC, Jacob Rozbruch MD specializes in diagnosing and treating piriformis syndrome and other medical conditions of the spine. Many patients suffer months or even years before being properly diagnosed with piriformis syndrome. With decades of experience treating spinal conditions, Jacob Rozbruch MD is an expert at detecting piriformis syndrome and creating an effective treatment or surgical regimen. Dr. Jacob Rozbruch is a specialist in sports-related injuries in New York City. Jacob Rozbruch MD suggests that sports-related injuries are handled by an orthopedic specialist and not a general practitioner or emergency room physician: “Not every emergency room physician is orthopaedically trained,” states Dr. Jacob Rozbruch. He also cautions those who suffer from Achilles tendonitis that an untrained doctor can misdiagnose and inefficiently treat an inflamed Achilles tendon.